I had a sudden thought to see what was happening on Julian Assange. I have been reflecting on truth and corruption and how much energy is used in obscuring the truth or to deny one’s own responsibility. Imagine if all children were taught values whereby they came to understand that values is the very pathway to happiness and peace. The values I speak of are universal, what I see in you is in me. I stand in your shoes and imagine what it feels like to be you. What I am observing is that people are increasingly becoming silent when asked to speak the truth, they believe that is peace. They do not seem to be responding with empathy or opening dialogue to solve problems and ensure that all are treated in equality and fairness, the very foundation of justice. I see the issue with Julian as a mirror to society. We the people have to find our truth in order to see it reflected in the world. What we fear we attract, what we focus on we create. So perhaps we can start to observe what it is we value and what we create as a society. What values are important? It takes courage to speak up, a journey begins but if one can stay with the truth, the whole truth and nothing but the truth perhaps life, liberty and happiness can transmute from a statement of American values to one of universal values, that every citizen on the planet can adhere to. 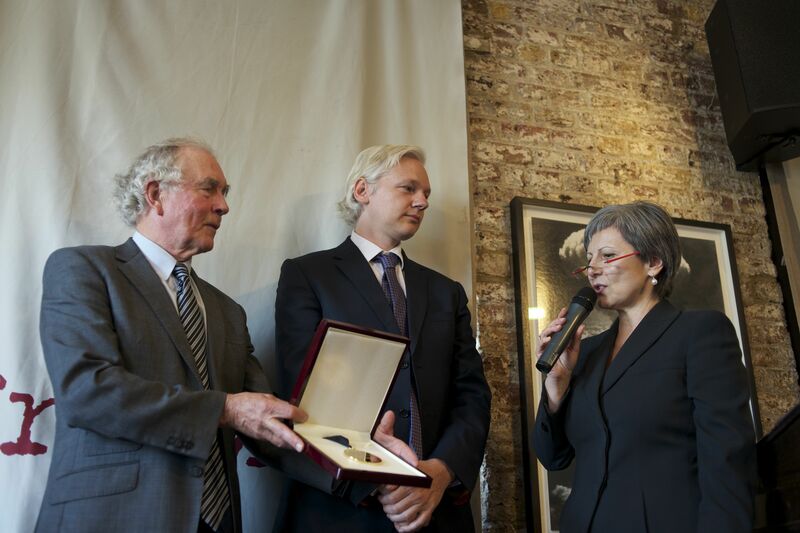 I discovered that Julian Assange received the Sydney Peace Medal in London in mid 2011. There are video’s available on the Sydney Peace Foundation website (below). This is an independent perspective on his case. It is wise to be open to all perspectives. That is the basis of democracy. I know as a dispute resolver that we have to be open to views without demonising. I am very conscious these days of labelling and demonising, whenever I hear criticisms that label people I know that there are agenda’s behind. When we state things as they are without judgement, the truth will become visible like the little plant coming through the hard ground. The virtues of truth are far stronger than any resistance that deception can conjure. The truth will set all free. Professor Stuart Rees is a Emeritus Professor from the Sydney Peace Foundation and Mary Kostikidas is a former journalist anchor on SBS Television. If you seek truth you will appraise all perspectives. Below is an overview of the Sydney Peace Foundation award. The Sydney Peace Foundation has awarded its Gold Medal for peace with justice to WikiLeaks co-founder Julian Assange. The citation reads, ‘For exceptional courage and initiative in pursuit of human rights’. ‘Assange’s work is in the Tom Paine Rights of Man and Daniel Ellsberg Pentagon Papers tradition- challenging the old order of power in politics and in journalism. Assange has championed people’s right to know and has challenged the centuries old tradition that governments are entitled to keep the public in a state of ignorance. In the Paine, Ellsberg and Assange cases, those in power moved quickly to silence their critics even by perverting the course of justice’. The Sydney Peace Foundation Gold Medal was awarded to Julian Assange at a ceremony in mid 2011. 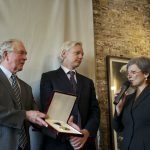 Presented by veteran Australian broadcaster Mary Kostakidis, the Sydney Peace Medal recognises Assange’s leadership, courage and tenacity in journalism and publishing, and pays tribute to his enduring conviction that truth matters and justice depends on it. Kostakidis, a former member of the Australian Human Rights Consultation Committee, praised WikLeaks as an “ingenious and heroic website that has shifted the power balance between citizen and the state by exposing what governments really get up to in out name”. Acknowledging that “exposing secrets can be dangerous business”, Kostakidis thanked Assange for his “heroic courage” as a whistleblower to take “great risks for our benefit”. In accepting the Gold Medal, Mr Assange said, “The real value of this award, and the Sydney Peace Foundation is that it makes explicit the link between peace and justice”. “It does not take the safe feel good option of shunning controversy by uttering platitudes. Instead it goes into difficult terrain by identifying organisations and individuals who are directly engaged in struggles of one kind or another,” he said. Assange has received a great number of other awards including: Economist Freedom of Expression Award (2008), Amnesty International UK Media Award (2009), Award of Distinction in the Digital Communities (2009), Sam Adams Award (2010), Le Monde Person of the Year (2010), Martha Gellhorn Prize for Journalism (2011), Voltaire Award of the Victorian Council for Civil Liberties (2011), Walkleys Award for Outstanding Contribution to Journalism (2011) and the Italian Privacy Award (2012).